In recent years, there has been a huge increase in the amount of publicly-available and proprietary information pertinent to drug discovery. However, there is a distinct lack of data mining tools available to harness this information, and in particular for knowledge discovery across multiple information sources. At Indiana University we have an ongoing project with Eli Lilly to develop web-service based tools for integrative mining of chemical and biological information. 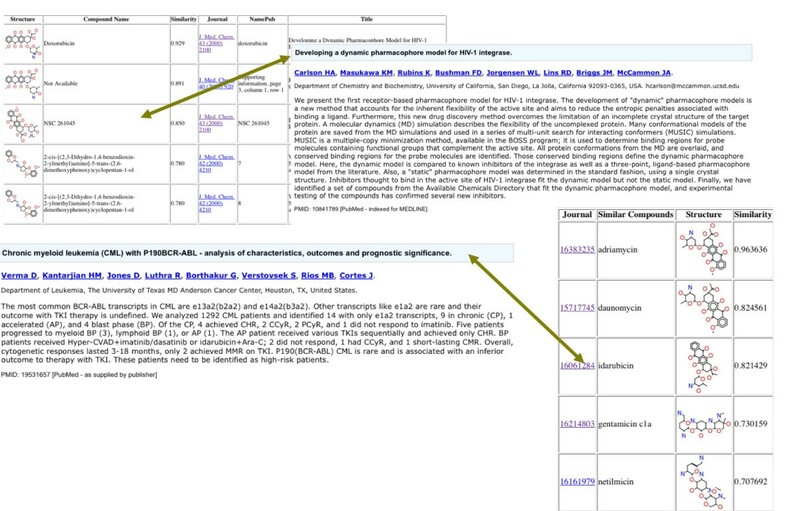 In this paper, we report on the first of these tools, called WENDI (Web Engine for Non-obvious Drug Information) that attempts to find non-obvious relationships between a query compound and scholarly publications, biological properties, genes and diseases using multiple information sources. We have created an aggregate web service that takes a query compound as input, calls multiple web services for computation and database search, and returns an XML file that aggregates this information. We have also developed a client application that provides an easy-to-use interface to this web service. Both the service and client are publicly available. 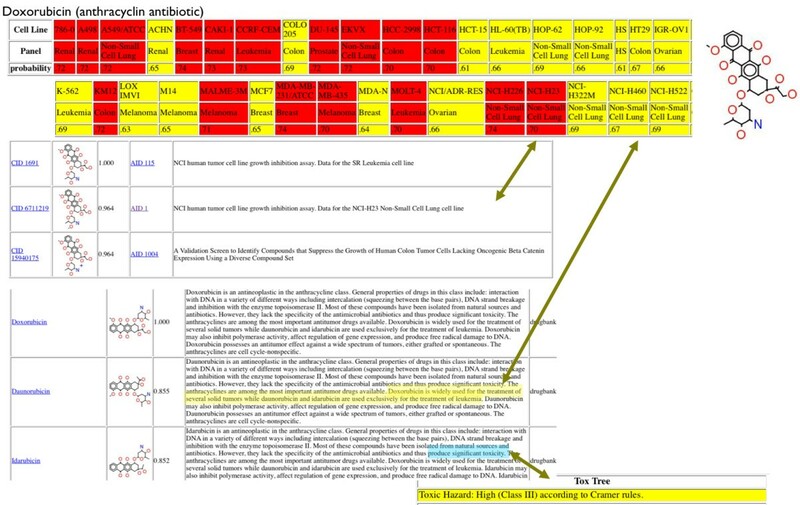 Initial testing indicates this tool is useful in identifying potential biological applications of compounds that are not obvious, and in identifying corroborating and conflicting information from multiple sources. We encourage feedback on the tool to help us refine it further. We are now developing further tools based on this model. In common with most scientific disciplines, there has in the last few years been a huge increase in the amount of publicly-available and proprietary information pertinent to drug discovery, owing to a variety of factors including improvements in experimental technologies (High Throughput Screening, Microarray Assays, etc), improvements in computer technologies (particularly the Web), funded "grand challenge" projects (such as the Human Genome Project), an imperative to find more treatments for more diseases in an aging population, and various cultural shifts. This has been dubbed data overload  Significant effort has therefore been put into the development of computational methods for exploiting this information for drug discovery, particularly through the fields of Bioinformatics and Cheminformatics. Of particular note are the provision of large-scale chemical and biological databases, such as PubChem , ChemSpider , the PDB , and KEGG , which house information about massive numbers of compounds, proteins, sequences, assays and pathways; the development of predictive models for biological activity and other biological endpoints; data mining of chemical and biological data points; the availability of journal articles in electronic form, and associated indexing (such as in PubMed) and text mining of their content. Further, we are seeing an unprecedented amount of linking of information resources, for instance with Bio2RDF , Linking Open Drug Data  and manual linking of database entries. One of the next great challenges is how we can use all of this information together in an intelligent way, in an integrative fashion . We can think of all these information resources as pieces of a jigsaw, which in their own right give us useful insights, but to get the full picture requires the pieces to be put together in the right fashion. We thus not only need to aggregate the information, but we also need to be able to data mine it in an integrative fashion. There are a number of technologies that are becoming available that assist with this: in particular, web services and Cyberinfrastructure  allow straightforward, standardized interfaces to a variety of data sources and Semantic Web languages such as XML, OWL and RDF permit the aggregation of data, and representation of meaning and relationships in the data respectively. At Indiana University, we are tackling this problem from several angles. We recently developed a Cyberinfrastructure for cheminformatics, called ChemBioGrid, which has made a multitude of databases and computational tools freely available for the first time to the academic community in a web service framework . Of particular import, we have been able to successfully index chemical structures in the abstracts of large numbers of scholarly publications through a collaboration with the Murray Rust group at Cambridge. The infrastructure has spurred the development of several important client applications, including PubChemSR , and the application of Web 2.0 style "mashups" using userscripts for a variety of life-science applications . We are continuing to support and further develop this infrastructure. With this infrastructure in place, we have investigated a variety of strategies for integrating the chemical and biological data from different sources in the infrastructure, in particular of (i) the application of data mining techniques to chemical structure, biological activity and gene expression data in an integrated fashion , (ii) the development of a generalizable four layer model (storage, interface, aggregation and smart client) for integrative data mining and knowledge discovery , and (iii) aggregation of web services into automatically generated and ranked workflows . We are now investigating methods for applying these techniques on a larger scale, particularly to be able to extract knowledge from large volumes of chemical and biological data that would not be found by searching single sources, and to be able to use multiple independent sources to corroborate or contradict hypotheses. To do this, we are employing two key technologies: aggregate web services which call multiple "atomic" web services and aggregate the results, and Semantic Web languages for the representation of integrated data. In this paper we describe one of the first products of this work, a tool called WENDI (Web Engine for Non-obvious Drug Information) that is designed to tackle a specific question: given a chemical compound of interest, how can we probe the potential biological properties of the compound using predictive models, databases, and the scholarly literature? In particular, how can we find non-obvious relationships between the compound and assays, genes, and diseases, that cross over different types of data source? We present WENDI as a tool for aggregating information related to a compound to allow these kinds of relationships to be identified. Of course, the power of this kind of integration comes from identifying truly non-obvious but yet real relationships between these entities. Our aim in this work is to allow a rapid differentation between known relationships (i.e. those which a scientist with a reasonable understanding of the literature in a field could be expected to already know), and unknown relationships (those which could not be found in literature closely associated with a field, or not part of the 'art' of the field). There is clearly some fuzziness in this, and this makes evaluation of a tool like WENDI for non-obviousness difficult. However, we do present it as a useful tool based on qualitative feedback from existing users, and we are currently devising ways of a more quantitative evaluation (as described in the concluding section). 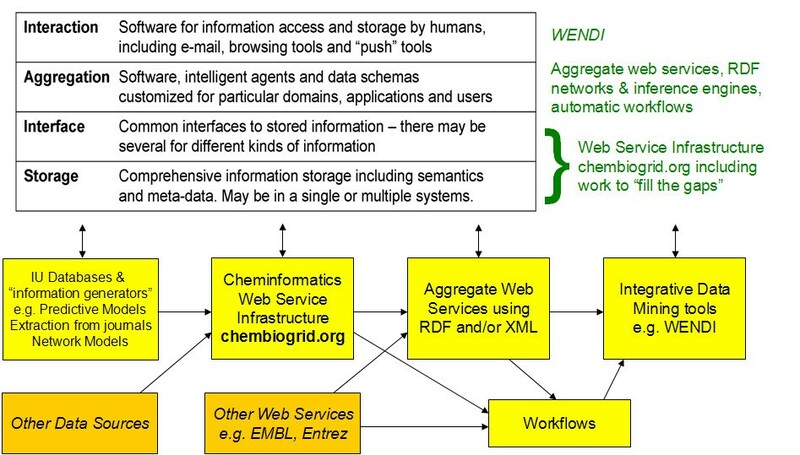 We have since extended the ChemBioGrid infrastructure to be the primary data source for WENDI. Additionally, for WENDI we have introduced the idea of aggregate web services that call multiple individual, or atomic, web services and aggregate the results from these services in XML. For example, the main web service used by WENDI takes as input a SMILES string representing a compound of interest, and outputs an XML file of information about the compound aggregated by calling multiple web services. This XML file can then be parsed by an intelligent client to extract information pertinent to compound properties. The overall architecture uses a four layer approach which we described previously  that includes storage, interface, aggregation and smart interface layers (see Figure 1). The storage and interface layers are implemented using the Web Service Infrastructure, and our initial work developing aggregate web services and smart clients comprises the work described here. Overall architecture of storage, interface, aggregation and interaction layers employed in WENDI. Each layer can be accessed directly, or by higher layers. Web services either follow the Simple Object Access Protocol (SOAP) standard  or REpresentational State Transfer (RESTful) approach , the latter of which are often better integrated with Hypertext Transfer Protocol (HTTP) than SOAP-based services. Whilst we have both kinds of web service in operation, we primarily use REST service. For example, we have created a 3D similarity searching Web Service is based on our local PubChem 3D database which stores 3D structures  and 12 distance moments  for all the compounds in the PubChem database. This service is called by the WENDI web service. A mirror of the PubChem Compound database, containing compound ID's (CIDs), InChI, SMILES, compound properties, and 166-key MACCS-style fingerprints  generated by the gNova CHORD system. A mirror of the DrugBank dataset  containing CID's (mapping to PubChem), DBID's (Drugbank ID's), drug names, SMILES, usage descriptions, and 166-key fingerprints. The database contains nearly 4800 drug entries including >1,350 FDA-approved small molecule drugs, 123 FDA-approved biotech (protein/peptide) drugs, 71 nutraceuticals and >3,243 experimental drugs. An implementation of the Maximum Recommended Therapeutic Dose (MRTD) set  including name, SMILES, and 166-key fingerprints. The database contains 1,220 current prescription drugs available in SMILES format from the FDA Web site. a matrix of predictions of gene-disease relationships based on known relationships mined from the literature and machine learning predictions . cross-species chemical-gene/target interactions and chemical-disease relationships derived from experimental sets and the literature . an encyclopedia of human genetic variation in health and disease . a database of bioactive drug-like small molecules, containing 2-D structures, calculated properties (e.g. logP, Molecular Weight, Lipinski Parameters, etc.) and abstracted bioactivities (e.g. binding constants, pharmacology and ADMET data) . 2D Tanimoto similarity searching of these datasets is made available by the gNova CHORD tanimoto function applied to the 2D public 166 keys, an implementation of the popular MACCS keys. Without indexing, it runs very effectively for a single query or on a small dataset, but the speed reduces significantly for large datasets. We have 56,911,891 compounds in our PubChem Compound table as the time of writing. To speed up the searching, we implemented a method described by Swamidass & Baldi to reduce the subset of molecules that need to be searched in similarity calculations . The method uses simple bounds on similarity that can be applied when a similarity threshold is used (given two fingerprints A and B, and a threshold t, we can calculate a maximum similarity between the fingerprints as min (a,b)/(a+b-min (a/b)), where a and b are the number of bits set in A and B respectively). In addition to 2D similarity searching, 3D similarity searching is provided on Pub3D database using 12-dimensional molecular shape descriptors  calculated for our Pub3D database of 3D minimized structures of PubChem compounds. Similarity to a query is calculated using Euclidean Distance. We use PostgreSQL to store all these 12D vectors for all compounds, with the CUBE type  extension. Tumor cell line predictions. We created 40 Random Forest models for prediction of human tumor cell line inhibition, trained using data from the NCI Developmental Therapeutics Program Human Tumor Cell Lines . These predictions output a probability of activity for a compound (0-1). We have created a main WENDI aggregate web service, and a web-based client that employs the web service. The web service takes a query SMILES string as input (through a SOAP or REST interface), and calls a variety of web services and database searches using the query. Results are returned as an aggregate XML file with sections delineated according to the atomic web service that was called. Additional XML tags are added by the web service, in particular, Gene Ontology terms in the PubChem Bioassay descriptions, Drug descriptions (from Drugbank) and paper titles and abstracts, are extracted and tagged with Gene Ontology ID's (GOID's). These permit associations to be made between genes and assays, drugs and papers. The primary way that the databases are employed in WENDI is through similarity searching: finding compounds in the databases that are similar to the query, which have some known property: for example, we retrieve compounds that are similar (>0.85 Tanimoto) to a query molecule that are active in a given bioassay, are known drugs, or are referenced in a journal article. Based on the similar property principle  we can assume that these molecules are likely to have similar properties to the query compound, thus be of interest in understanding the potential properties of the query. Predictive models results presents the predicted probability of activity of the compound in 40 Human Tumor Cell line assays, organized by panel type (renal, non-small cell lung, breast, colon, etc) and color coded according to probability of activity (red for > = 0.7, yellow for > = 0.6 and <0.7, and grey for <0.6). Confusion metrics are also presented to allow the validity of these models to be assessed. Also presented are the results of a ToxTree analysis, particularly the classification according to Cramer rules  and a breakdown of presence or absence of known toxic fragments. Similar compounds from chemogenomics data presents a list of similar compounds (Tanimoto similarity values given) from CTD, ChEMBL data that include the relationships with compounds and genes/diseases. Similar compounds from Systems data presents a list of similar compounds (Tanimoto similarity values given) from KEGG data that include the relationships with compounds and Pathways/Enzymes. Inactivities of similar compounds presents the same informations as Activities of similar compounds sections, except for all of the similar PubChem compounds found that have been tested in bioassays and shown to be inactive. Finally, a link is given to the raw XML file, and PDF file for download. On submission of a query, WENDI generally returns results within a minute. We have tested WENDI with a variety of query compounds with known biological activities, one of them is described below. It can be simply tested by the reader by visiting the WENDI site. As an example, a screenshot of the first results returned for Doxorubicin are shown in Figure 2. Screenshot of the results returned from WENDI for Doxorubicin. Doxorubicin is an anthracyclin antibiotic that is used primarily as a nonspecific tumor inhibitor (including cancers of the bladder, breast, stomach, lung, ovaries, thyroid, along with soft tissue sarcoma and multiple myeloma). The mechanism of action is not fully understood, although it is thought to be a DNA intercalator. Screenshot of the insights from the literature returned from WENDI for Doxorubicin. A chemical compounds recently submitted to PubChem, but not collected in our database yet, were also used as queries for WENDI. The results and some interpretations are given in the Table 1 and more results of other compounds tested by WENDI are shown in Table 2. Generalized, nonspecific activity, although may be worth investigating for anti-tumor activity particularly colon cancer. Strong prediction (>70% probability) of activity in prostate, colon, non-small cell lung, breast, malanoma, leukemia, ovarian cancers. 50-60% probability in all other cell lines. In this paper, we present a integrative data mining tool for drug discovery using aggregate web services. 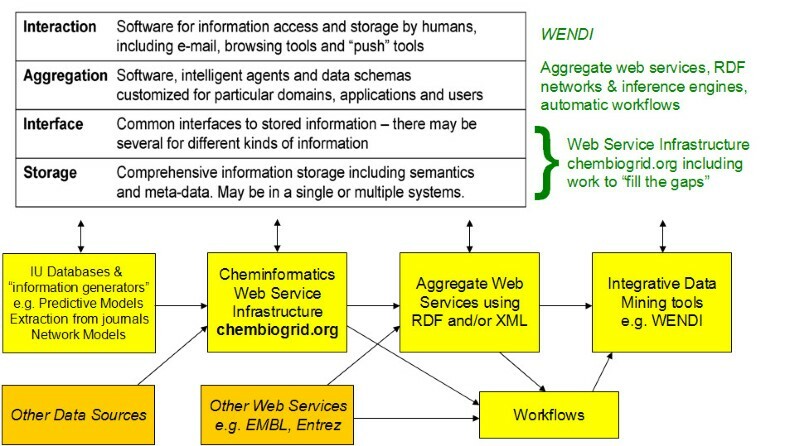 WENDI aims to build a full picture of potential biological activities of a chemical compound through the aggregation of data from web services that represent diverse multiple sources (including predictive models, databases and journal articles). WENDI allows the identification of corroborating or conflicting information: for instance, a compound might be predicted active in a breast cancer cell line, and similar compounds might show active in a PubChem BioAssay related to breast cancer, or be co-located in a paper abstract with a breast cancer related gene. We are now deveoping a next generation of tools based on WENDI and our recent Chem2Bio2RDF system  for exploring inferred relationships between compounds and diseases, genes, pathways using Semantic Web technologies including ontologies and RDF. We are also devising ways of quantitatively evaluating the extent to which WENDI truly identifies 'non-obvious' kinds of relationship, including using a corpus of literature in the field as the baseline for the 'obvious' relationships, as well as courting specific case studies from users for qualitative analysis. This work was supported by Eli Lilly & Company. We would like to thank Dr. Rajarshi Guha for assistance at the initial stage of this work. QZ carried out the whole implementation of WENDI, supervised by MSL and DJW. DJW made the examples in the result section, MSL and DJW modified this paper from the draft written by QZ. All authors have read and approved the final version of the manuscript.